I've printed a price list for the last couple of UK Games Expos. This year's is the biggest yet. 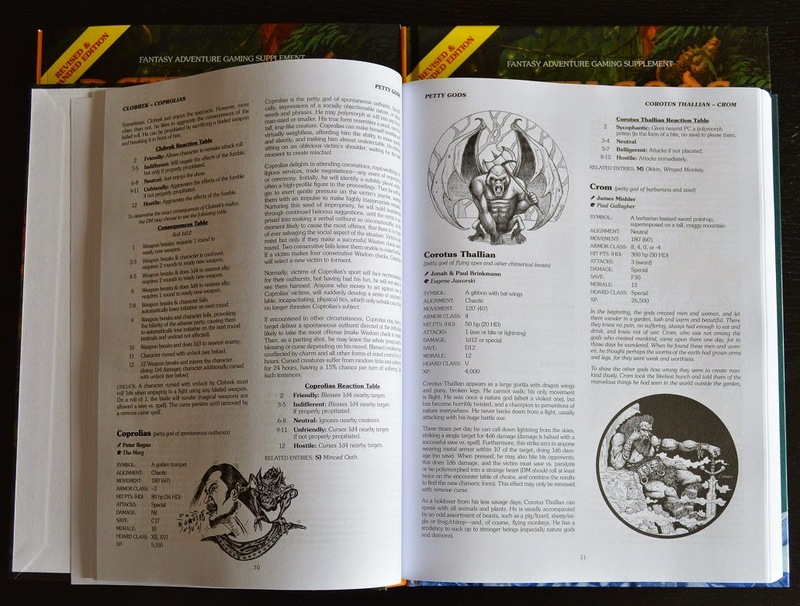 There's lots more of our own products, but there's still room for plenty of OSR, Savage Worlds, Miniatures, and a few board and card games. We'll be re-stocking the stand every day,but a few of the items are limited to just 1 or 2 copies. If you spot something you particularly want get to us as early as you can. If you can't see something on the stand please ask as I'm not sure they'll be room to display everything. Cthulhu Book Posters Project is Live! I've just launched my 13th Kickstarter project. 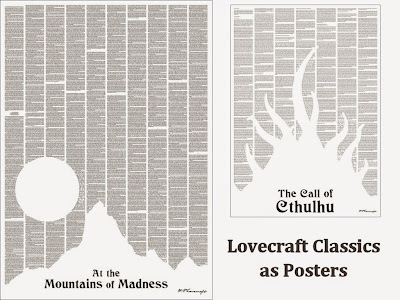 This time I'm funding a print run of two posters, each featuring the full text of a H.P.Lovecraft story. 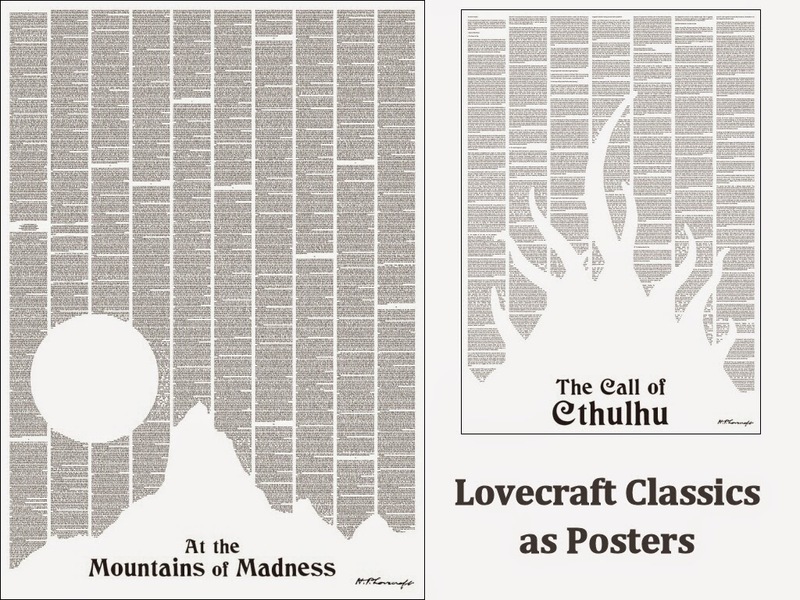 The first poster is A2-sized (420x594mm/16.5x23.4inches) and contains the entire text of The Call of Cthulhu. The second poster is A1-sized (594x841mm/23.4x33.1inches) and contains the entire text of At the Mountains of Madness. If you are at the UK Games Expo in Birmingham (29th-31st May), then you can take a look at them on the Squarehex stand. I'll also be selling my very limited test print-run stock of the posters at the show. I was very surprised to get a parcel from Lulu this morning. In it three hot off the press copies of Petty Gods. I got two hardbacks and one softcover of what is a very hefty book. I'm keeping one of the hardbacks but will take the other two copies with me to the UK Games Expo at the end of the month. If anybody going wants a copy I'm happy to sell them at £22 (Lulu price £18.98 + postage) for the hardback and £12 (Lulu price £9.98) for the softcover. Those prices are based on what I paid including a discount code and postage rounded up to the nearest pound. Well done to Richard LeBlanc and everyone else involved for getting this wayward project to completion. I'm really looking forward to giving it a proper read over several evenings. 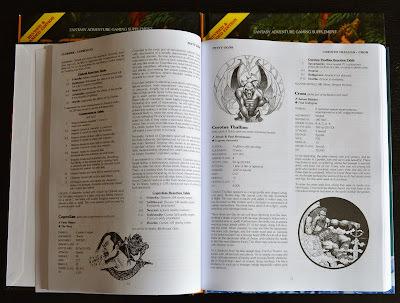 I hope the OSR can produce another project of this scale, and I would be very keen to submit material again. Here's photos of the books side-by-side. The second photo shows a randomly selected (it just happened to be the one with my entry on it) spread of the contents. This is an A2 map painted with a set of watercolour paints (the hard block type) that I borrowed from my daughter's art supplies. To start with I simply drew a rough line to mark the coast and the island. Then I laid down a thin wash of blue for the sea and light green for the land. Once dry I applied extra washes of; grey for the mountain, darker green for the forests, ochre for the swamps/marshes, and a slightly stronger blue for deeper areas of the sea. 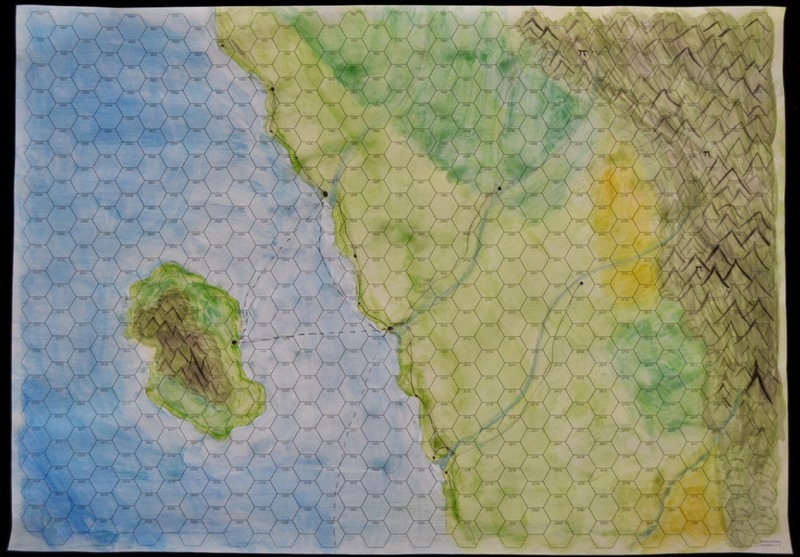 The rivers and mountain details were added in with a slightly thicker paint mix, and roads/settlements were added with rough dark pencil. 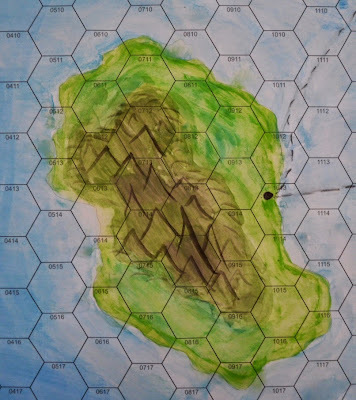 At this stage the map was very powdery so to stop the colour rubbing off I sealed with a thin mix of water and PVA glue. I've finished the Car Wars map that I posted as a work-in-progress here. I'm really pleased with how it turned out. I got a couple of other ideas whilst drawing it, but it might be a few weeks before I get time to draw any of them. 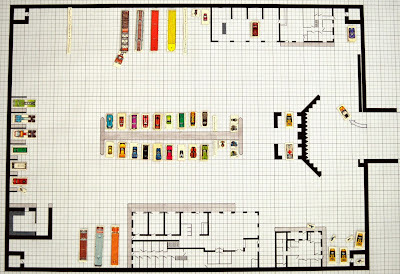 I also thought it would be cool to print some paper with the grey shading of the old Car Wars maps so that cut out buildings drawn on the white sheets can be placed on it. 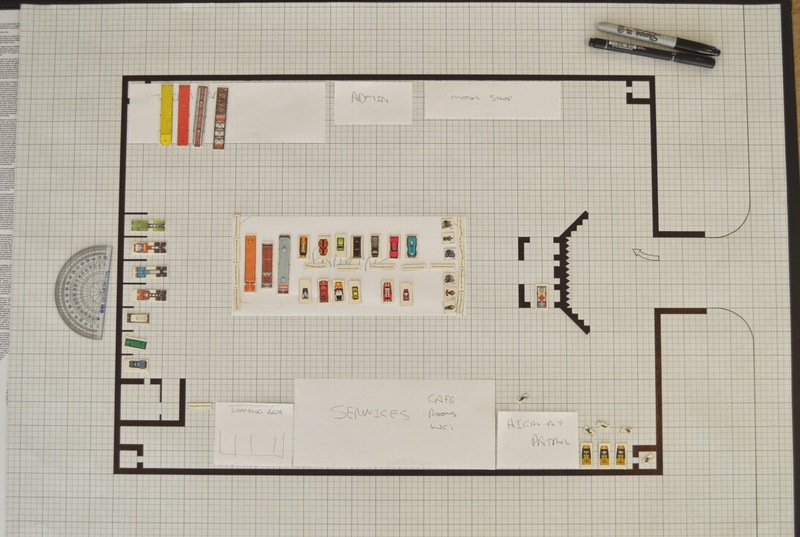 I'll add that to my long list of future mapping sheets. 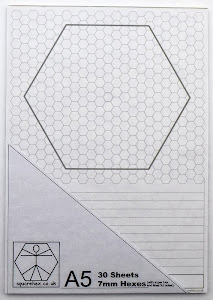 The blank mapping sheets can be found here. I'm really enjoying the bi-weekly Geomorph contest run by Inkwell Ideas. I'm using the contest as catalyst for not only spending more time drawing maps, but also to try out new ways of creating them. For my shrine entry, I created the whole map using Scribus (free DTP software). There's not a single bit of drawing on it. Everything is just lines and shapes added one-by-one. The map is called The Shrine of Collected Confessions. Worshipers place a coin in one of the fonts situated at the corner, and the door opposite opens as if by magic, to grant them access to one of the shrines four private chambers. They can then say their prayers, and confess their sins. Of course they are blissfully unaware that anything juicy that they reveal is recorded by the scribes in the secret chamber at the centre of the shrine. Although my stock of A2 quarter inch grid sheets turned up on Friday (pre-orders were all posted on Saturday), I've only just had a chance to draw something on one of them. 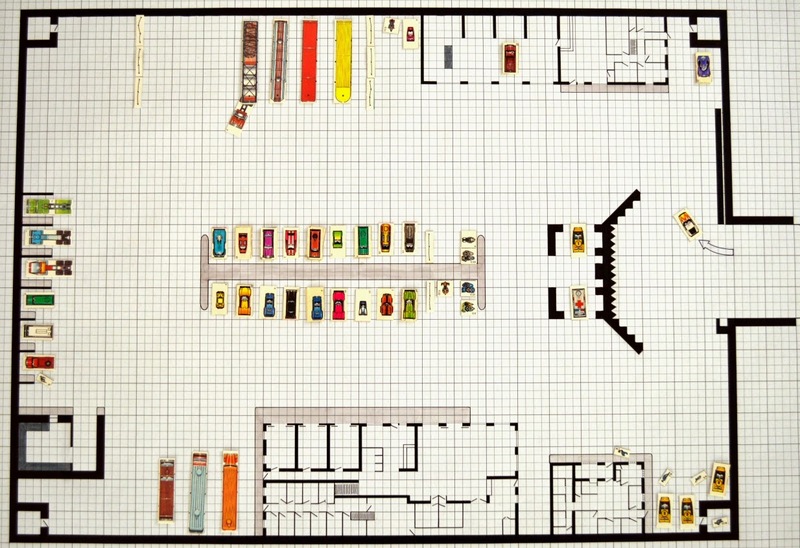 I'm drawing a map of a compound similar in style to the one featured in Truck Stop Car Wars supplement. I'm adding features that will feature in an adventure I've put together. I'll probably run the game using Savage Worlds rather than Car Wars but I'll still add some Car Wars elements. I'll try and do some more work on it over the next couple of days. 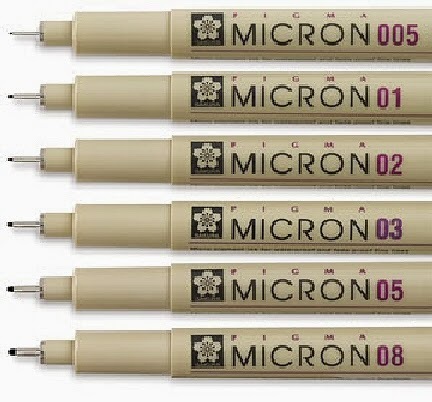 Following on from Tuesday's post which compared Unipin and Micron pens, here's a follow-up test. This time I've drawn the same boxes, but I first drew pencil outlines. I then went over the pencil lines with the pens, let the ink dry for an hour and erased the pencil. The test was suggested by Del Teigler in the Google+ comments for the post. 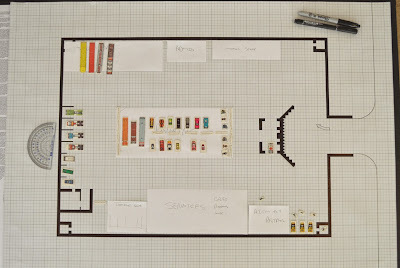 It makes quite a lot of sense as many maps will be drawn in ink over a pencil outline. The results were similar to the first test, but I think the Micron pens have done a better job of covering the pencil. On some of the boxes drawn with the Unipin pens there seems to be some shine coming though from the pencil (probably made worse by the scanner). 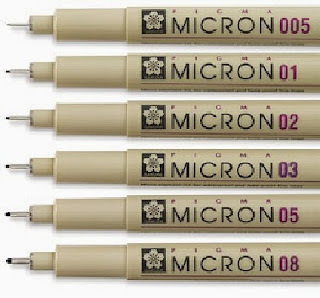 I think overall the Microns are the better pens. In the UK they are slightly more expensive than the Unipins, which may be an issue if you're a heavy user. I hope to review some more pens and pencils in the future, and possibly some other stationery items too. Like many old school mappers I do like my pens. I'm not overly fussy about them though, and at the £1-£2 each price range I'll happily try anything that comes along. 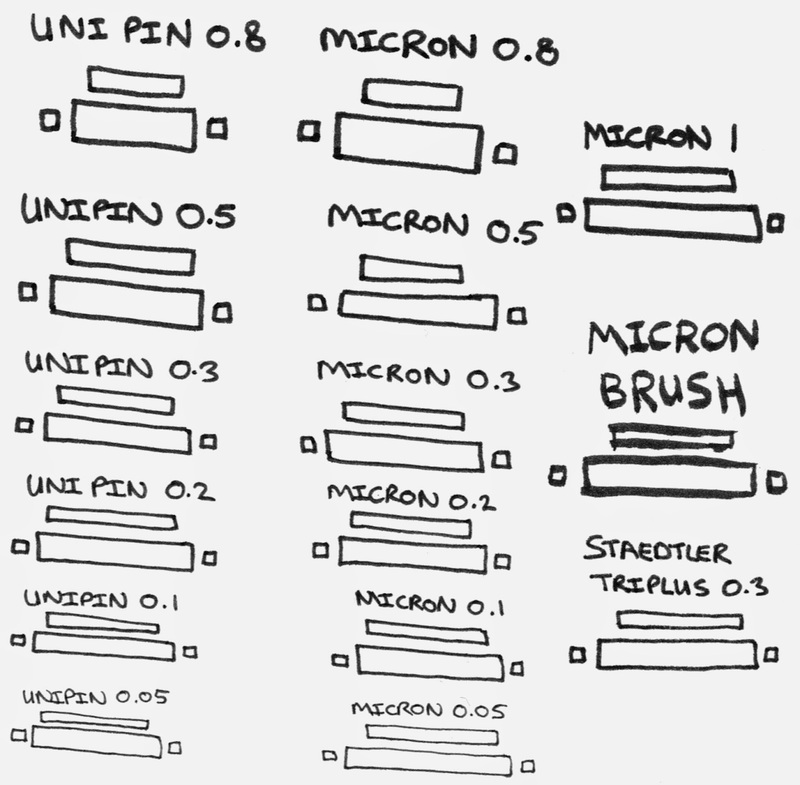 For the last year or so I've mostly been using UniPins, but recently I picked up a full set of Microns and decided to see how they compare in a crude test. 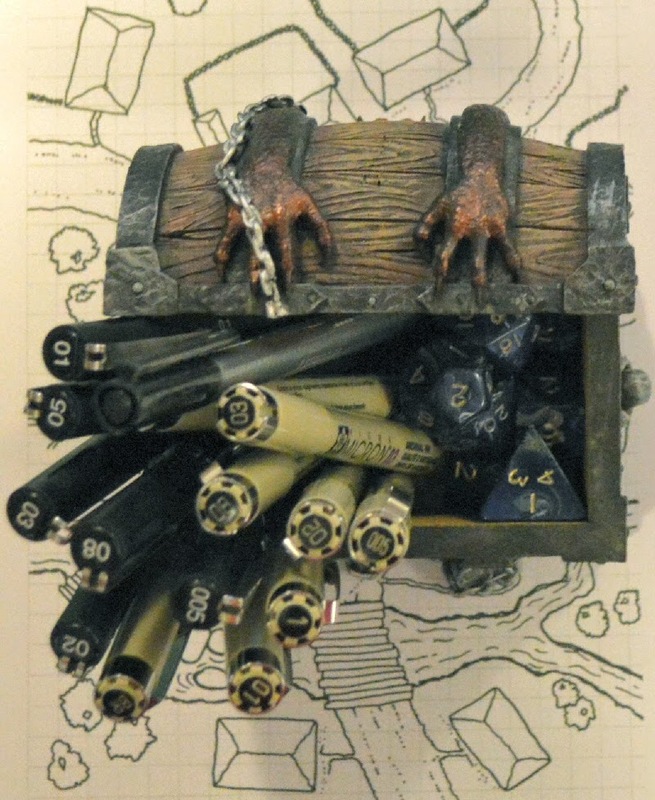 Here's a 600dpi scan of some text (more to show which pen is which) and some boxes. 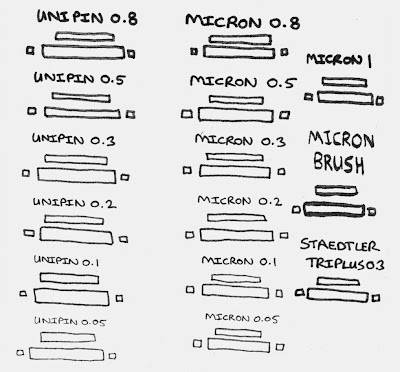 All the pens have been used for a while, but the Microns slightly less than the UniPins. 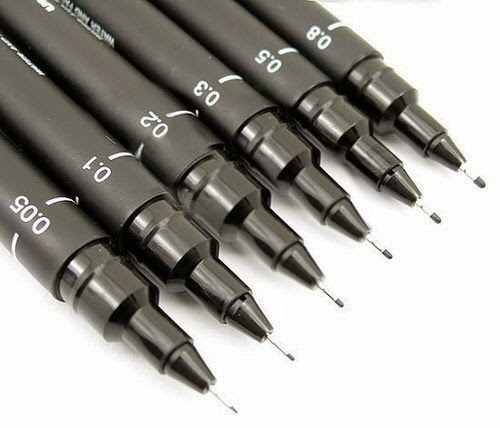 The Staedtler Triplus is included as a sort of control as I think it is a good all round choice that is not only cheap and widely available, but also comes in 30 different colours. 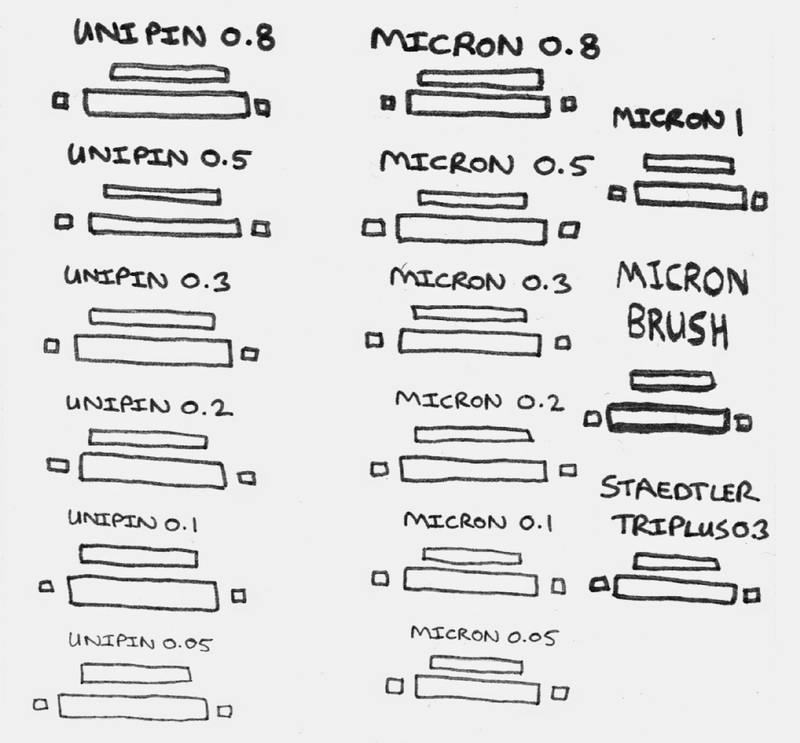 My initial thoughts are that the UniPins give smoother lines,but the Microns produce better black levels. 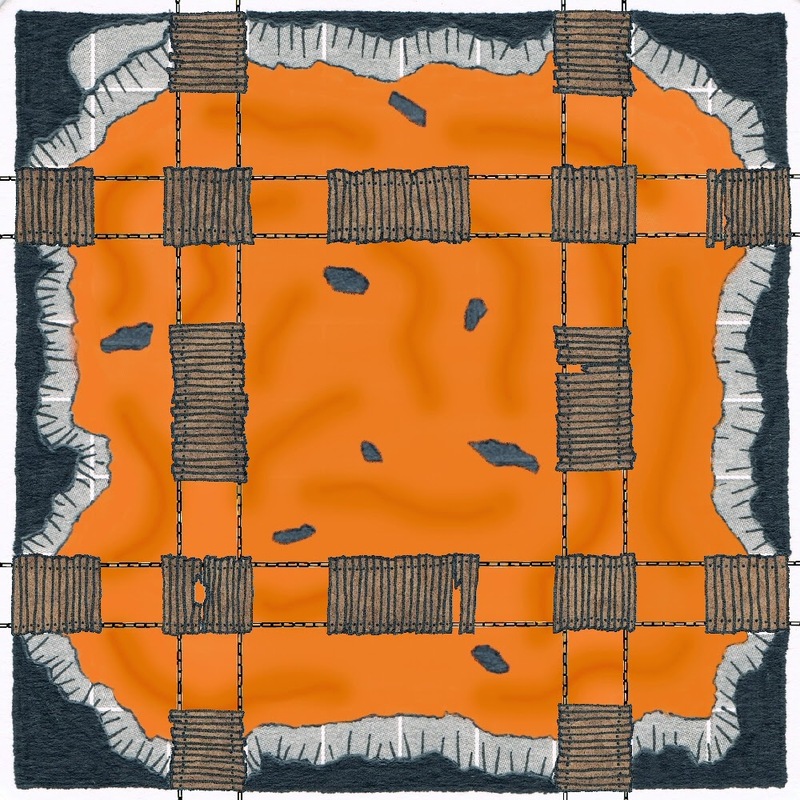 I just finished my second Lava Geomorph for the Inkwell Ideas #GeomorphMapContest. 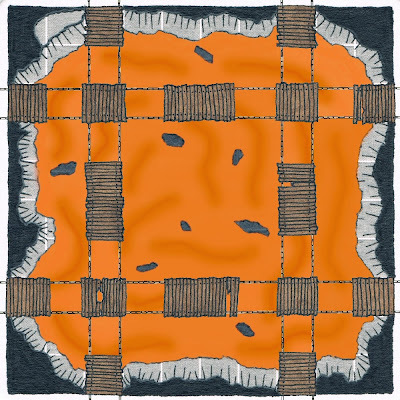 This one is entitled Hot Rock Crossing I created it by drawing the initial black border by hand then scanned and added a fill of lava colouring. 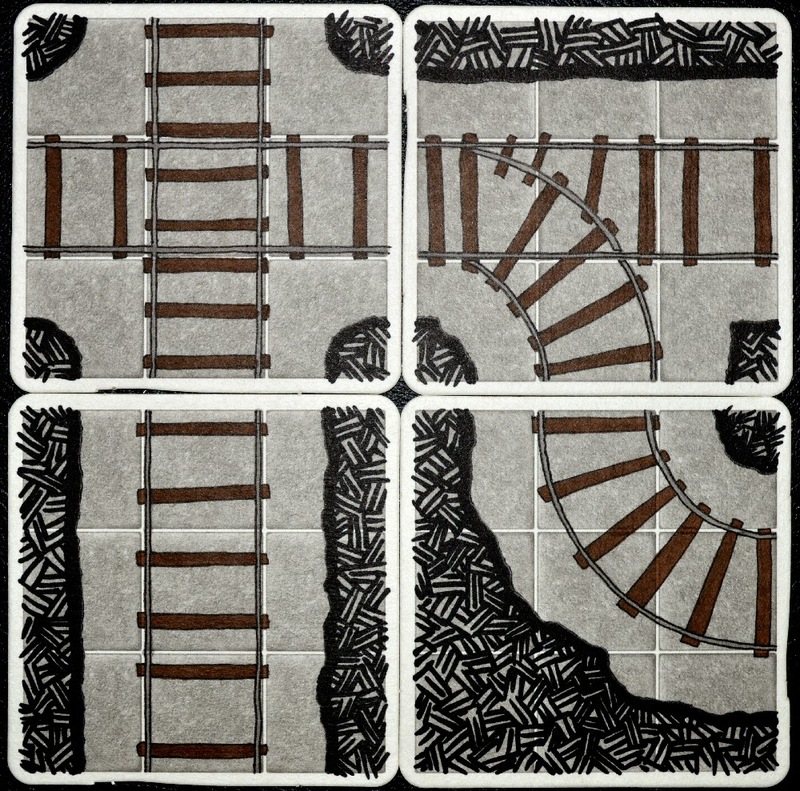 The other components (computer generated chains and hand-drawn wooden walkways) were then created as new images and dropped on to the main drawing one bit at a time. This is the last call for the Geomorphic Beermats Kickstarter which ends in about 3 hours. I've really enjoyed this campaign. Just one week ago I hadn't even considered it as a campaign. The beermats were just a little test print-run. Now it looks like I'm going to be ordering over 25,000 of the things! 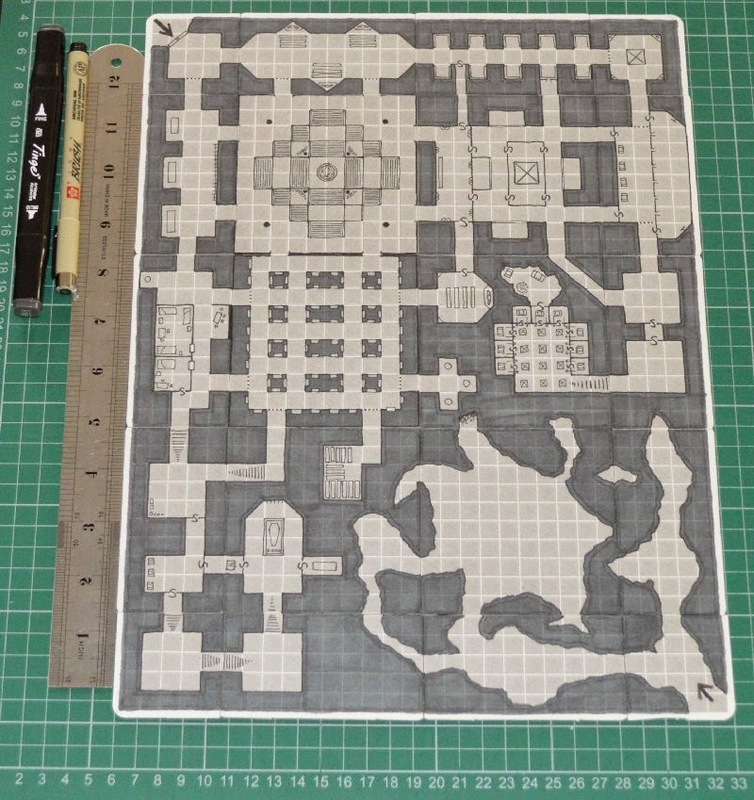 My last sample maps are some of some miniature-scaled sewers. They're pretty similar to the mines I posted earlier today, but show another potential use for the mats. The Geormorphic Beermats Kickstarter ends at 10pm (GMT) tonight. 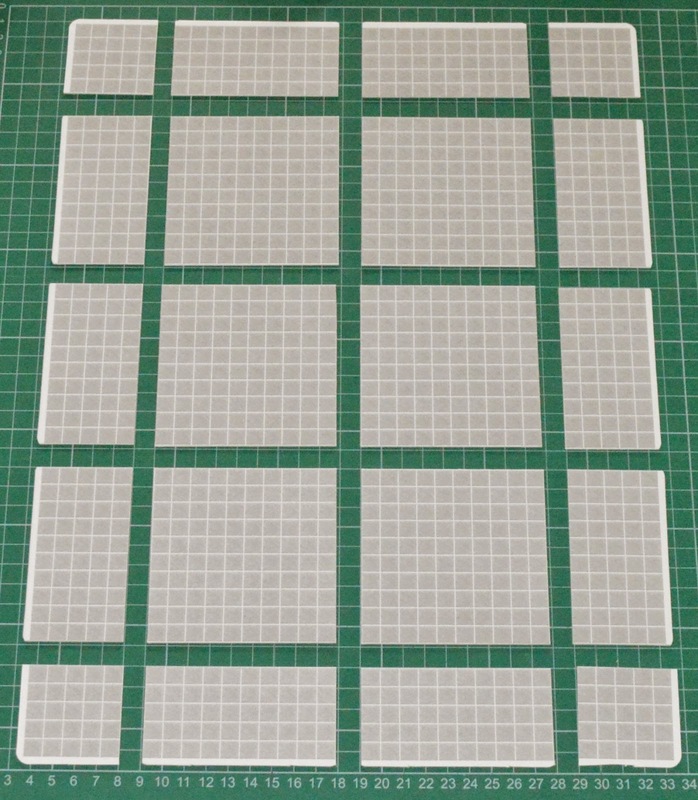 I'm hoping to get a couple more sets of sample tiles completed before then. The first of them show how the tiles can be used to create miniature-scaled mine track geomorphs. 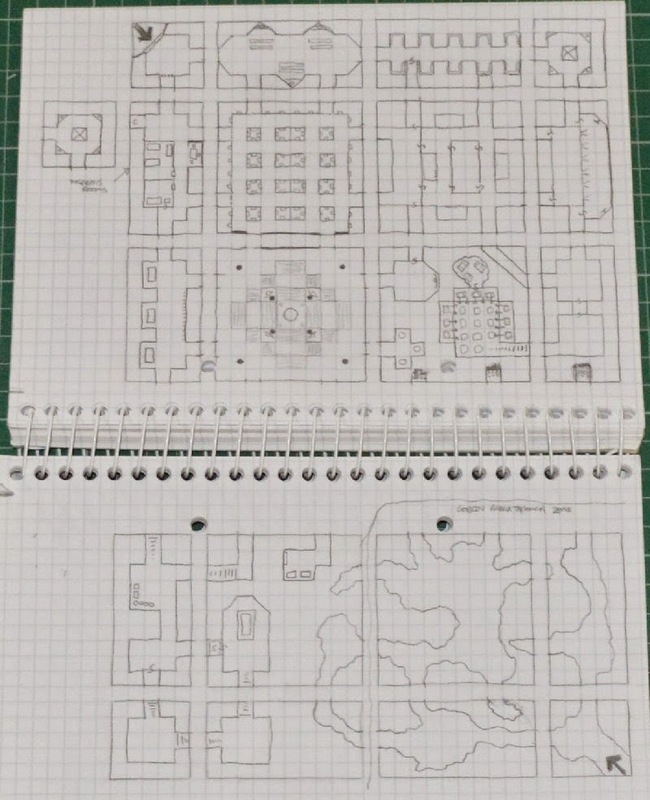 These took me about 5 minutes each, so it wouldn't take too long to produce even a complex map for a game. 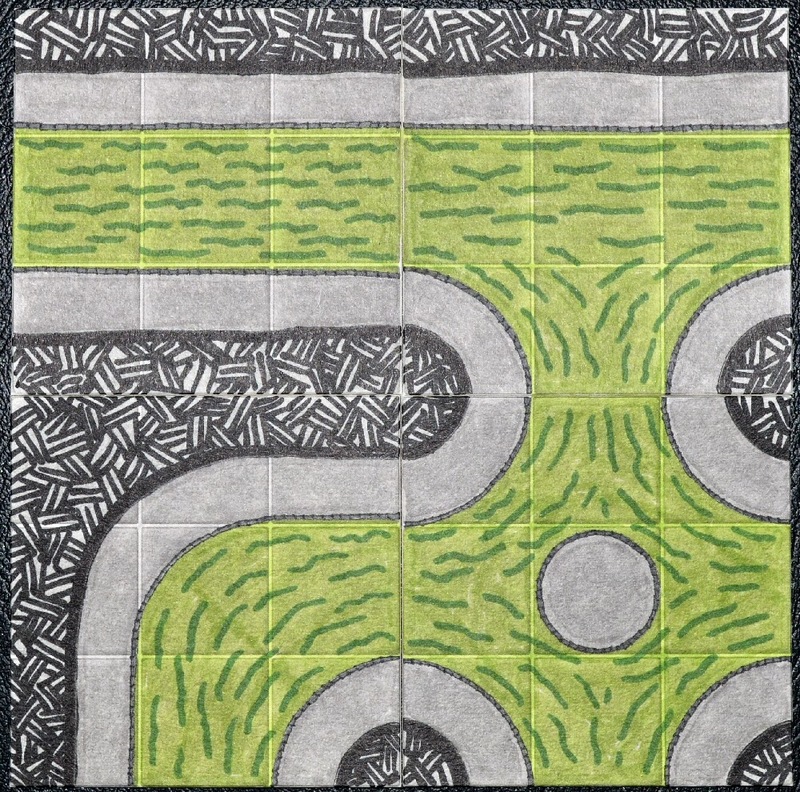 I haven't cut the borders away as I want to get on with another set of different tiles to post before the end of the Kickstarter. 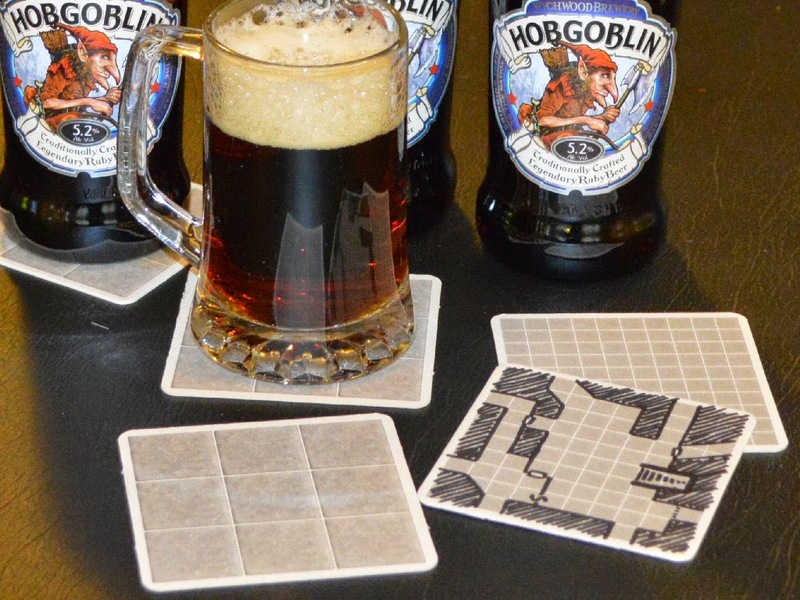 The Geomorphic Beermat Kickstarter is now in the final 33 hours. 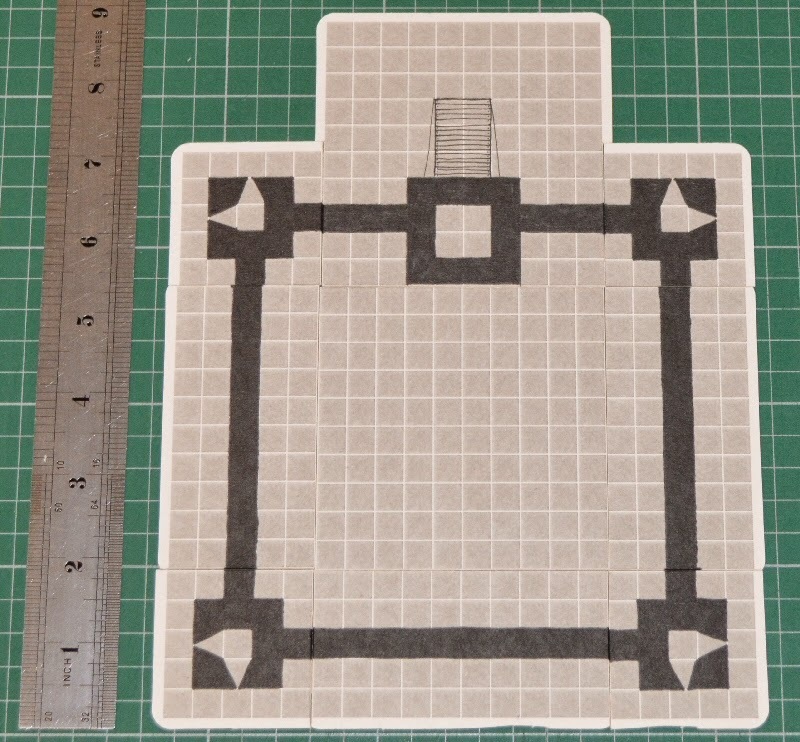 Today I want to show another possible use for the mats as very quick, modular castle tiles. 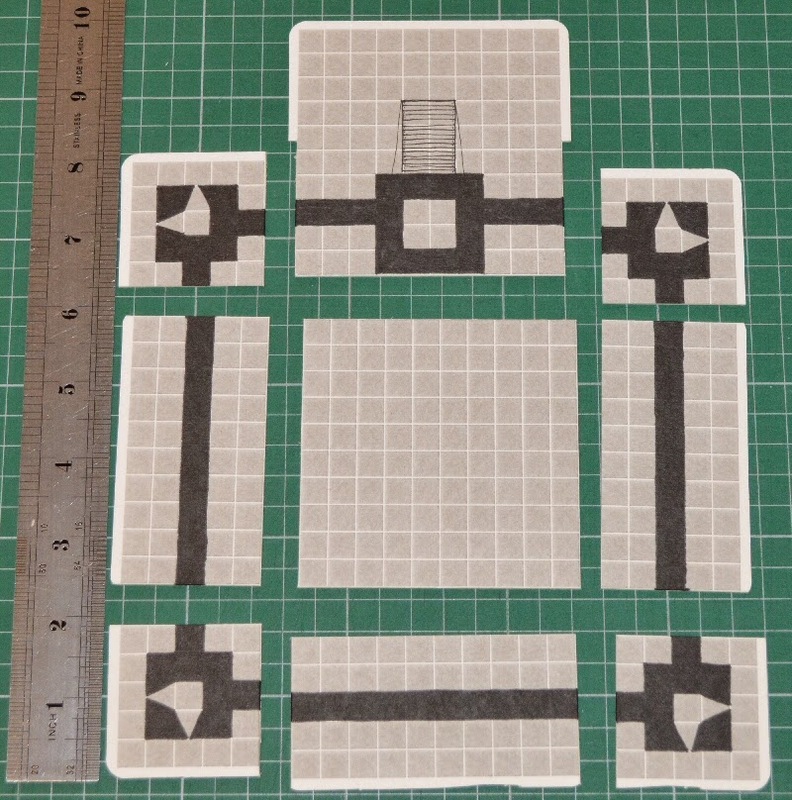 The example below is simple castle that was put together using just 5 beermats (without the extension for the drawbridge it would have been 4). 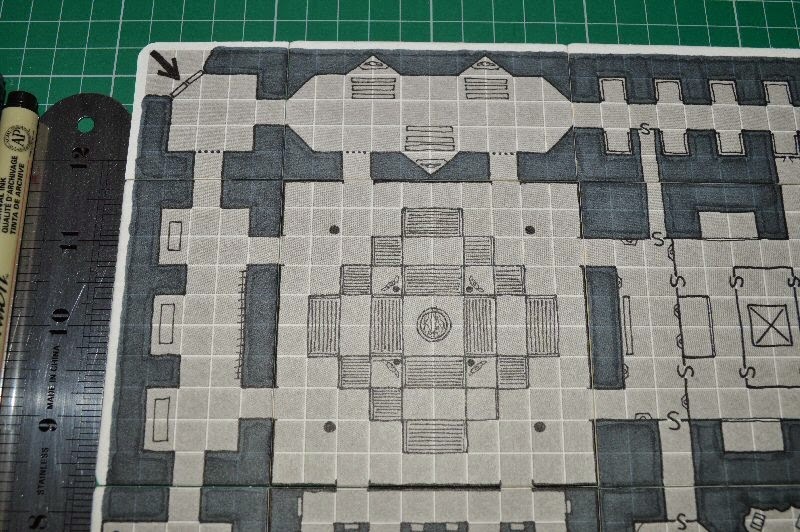 As the pieces are still drawn as geomorphs you can make a castle as big as you like. 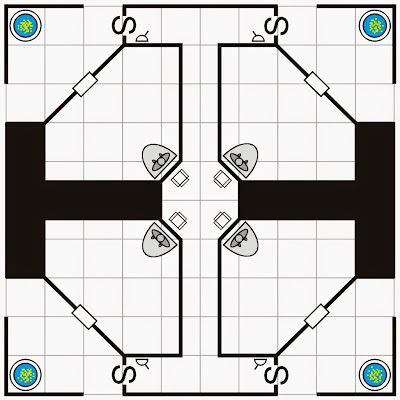 I've left the central area clear, but in use I'd probably draw a central keep on its own card that could simply placed on the map. Today I wanted to show how my Geomorphic Beermats may be used to create a larger map. I've stuck to the standard 8 entry/exit point layout, but with the addition of half and quarter tiles for edges and corners (I think Dyson used a similar layout last week and I it was really effective). The map is based on an adventure idea I've been thinking about for a while. It is essentially a large underground necropolis, with the added bonus of a tribe of Goblins tunneling into it from the south-east. When I write it up I may do a new version of the map but I think I'll keep most of the elements presented here. Below I've included the rough pencil version of the map that I drew out and about earlier in the week, and also the beermat (12 beermats used) components cut ready.